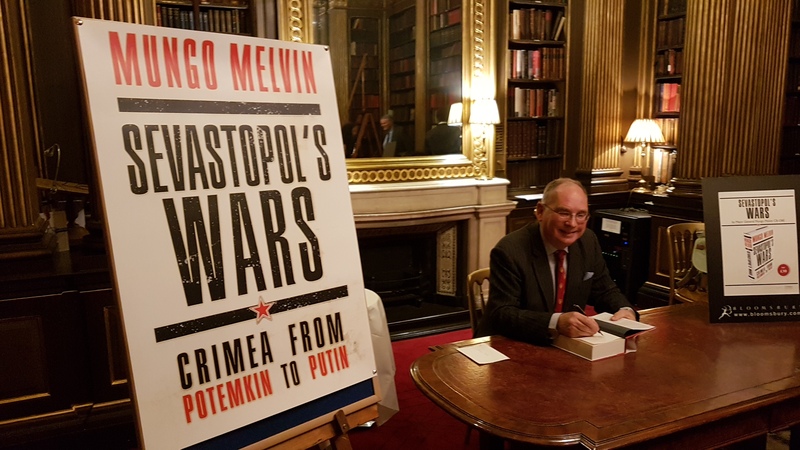 The Reform Club on London’s prestigious Pall Mall was the venue of the launch of Sevastopol’s Wars: Crimea from Potemkin to Putin on Wednesday, 5th April. Over 110 guests attended the drinks reception and book presentation, and a good many books were sold afterwards. 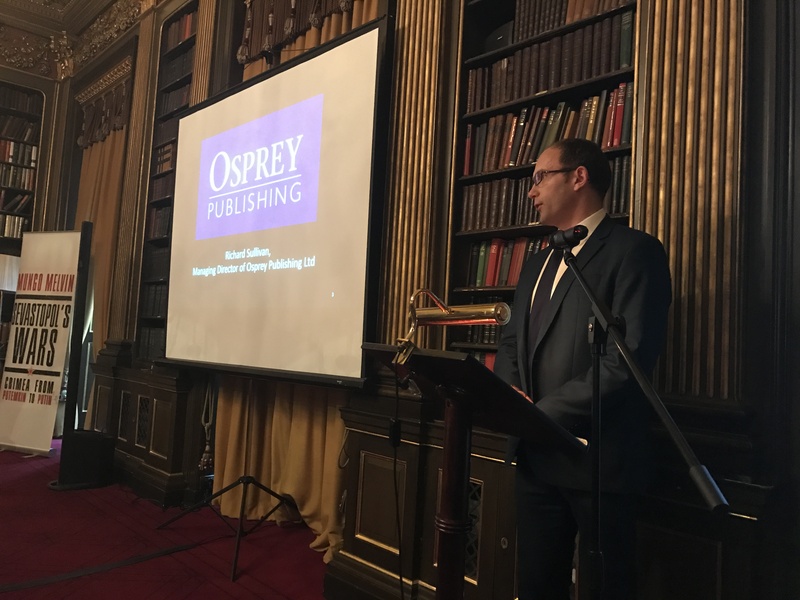 After a welcome by the Reform Club’s chairman, Professor John Schofield, Richard Sullivan, the Managing Director of Osprey Publishing introduced the book and its author, Mungo Melvin. 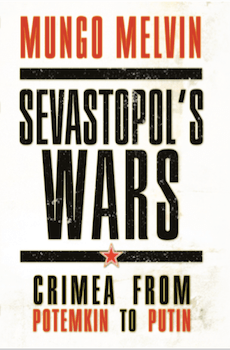 After an introductory chapter describing Crimea’s geography, ancient history and the Crimean Tatar Khanate, Sevastopol’s Wars describes the city’s military and naval development from its modern founding in 1783 to the events of 2014, thus embracing the Crimean War, the First World War and Russian Civil War, the Second World War and the Cold War. In the process, I describe rather more War than Peace, and indeed I quote at some length Leo Tolstoy, who extolled the special ‘spirit of Sevastopol’, when serving as young artillery officer in the city during the ‘first defence’ of 1854–1855 – some 349 days. The ‘second defence’ of the city followed during the Second World War when Manstein’s Eleventh Army besieged the city for 250 days. On 21 February 2014, a pro-Western people’s revolution took place in Kiev, Ukraine’s capital city, and President Viktor Yanukovych’s pro-Russian administration was overturned. Two days later, ‘self-defence’ units appeared in Sevastopol ostensibly to protect the city from Ukrainian nationalists. They established a ring of seven checkpoints on its approach roads. This action became known as Sevastopol’s ‘third defence’. Meanwhile, Russian Federation forces, many stationed on Crimea, intervened. Within a month, the Crimean peninsula and Sevastopol were both in Russian hands again following a controversial referendum. The world, and particularly the West, looked on – amazed by the audacity of the Russian action, deemed by many as unwarranted aggression and a violation of Ukraine’s territory. 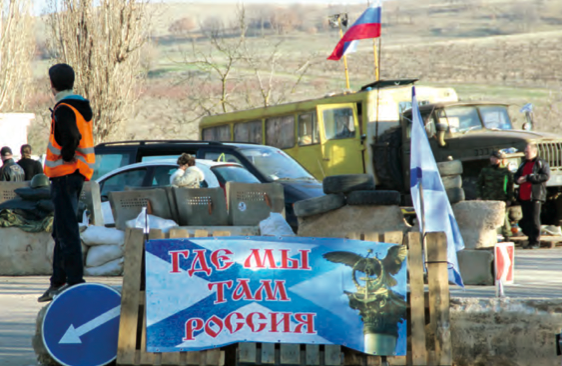 The final chapter of the book explains why and how, with Russian encouragement and support, a counter-coup in Crimea and Sevastopol occurred in 2014. My study of Sevastopol offers no emphatic judgements as to the rights and wrongs of either the current dispute between the Russian Federation and the West, or of the conflict between Ukraine and Russia. As opinions are so sharply divided on such matters, no doubt some perspectives presented in this book may please some, but equally offend others. But what I do attempt to show is that the events of 2014 in Crimea and Sevastopol can be traced either directly or indirectly to those of decades and even centuries before. 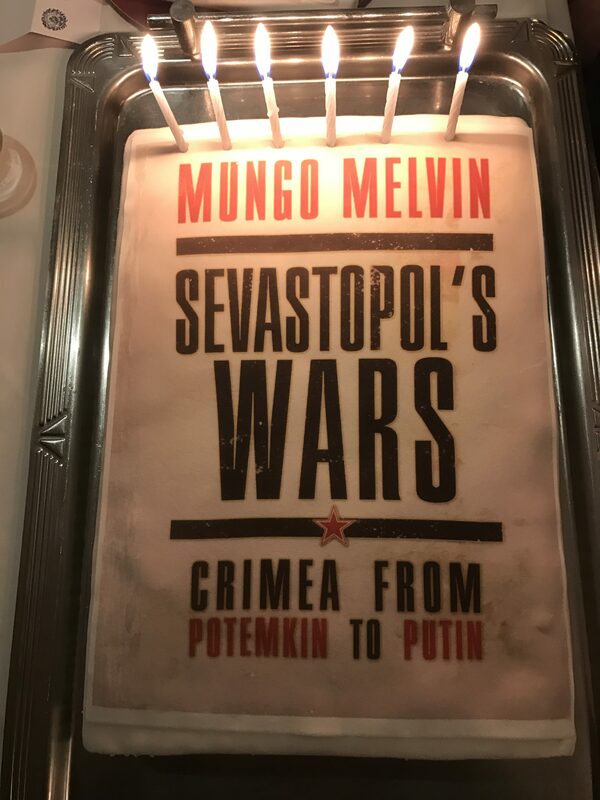 On the basis that such understanding may provide the best prospect for wise policy formulation in the future, I trust that Sevastopol’s Wars may both inform discussion and provoke some new thinking about Russia. I owe a great many people a huge debt of gratitude for their unstinting assistance to me in researching and writing this book over 6 years, and in reading and commenting on chapters in draft. The majority of them are present this evening. It would be unfair to single out any individuals except to highlight the members of my family, who have put up with me with great forbearance over the past few years, which I have dedicated to Sevastopol. I would also like to thank Richard Sullivan and all the staff at Osprey; and all the many organisations I am associated with for their help, including library support and historical advice: the Royal United Services Institute; the RE Museum, Library and Archive; the National Army Museum; the Royal Military Academy Sandhurst; and not least the British Commission for Military History and this splendid Reform Club. I thank you all so very much, and thank you for supporting me at this event. In closing, I would like to announce that I intend to dedicate a significant proportion of the advance I received on this book to a very worthwhile charity that promotes understanding between Russia and the United Kingdom – through the commemoration of the Arctic Convoy veterans. 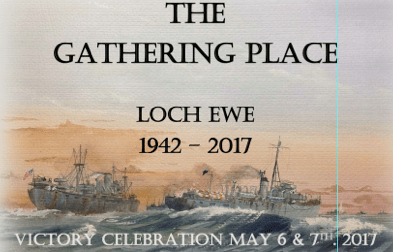 I shall be supporting their last gathering at Loch Ewe this May. I am delighted to be here at the launch of my father’s book. I flew back this morning especially from New York city in order to be here, not only because of the small role I played in proof reading and compiling the bibliography, but also because I am very proud of his achievement. It is through my work on the bibliography that the mammoth task of researching a book such as this really became apparent. Sevastopol’s Wars reflects a wealth of primary and secondary sources in Russian, French, German and English – some of which were accessed only through hunting in obscure archives. All this effort constitutes true research, and shows how deeply committed the historian must be to his task: a task, which I hope one day to emulate. As a classicist, I particularly enjoyed the first chapter – which covers the period before Potemkin – detailing the Greek settlement of ancient Chersonesos and the land of Tauris, known from Euripides’ play Iphigenia among the Taurians, whose inhabitants had a peculiar taste for human sacrifice. 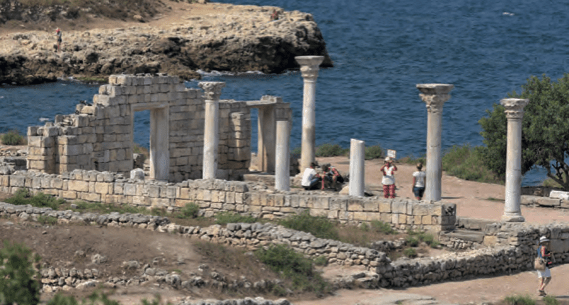 Indeed, the very name Sevastopol perhaps reflects the archaic Greek origins, meaning, literally ‘august or venerable city’ – Sebastos polis – or ‘city of Empress “Augusta”, Catherine the Great’. I immensely enjoyed the book, and I am sure that many others will do too. It gives me great pleasure, therefore, to hand over a copy of the book to Mr Hitesh Tailor of the Reform Club’s Library Committee. Andy Grainger presenting Mungo Melvin with a framed picture of Alexander Suvorov – ‘Train Hard, Fight Easy’. Mr Tailor then received the book and gave a few words of thanks on behalf of the Reform Club’s Library. 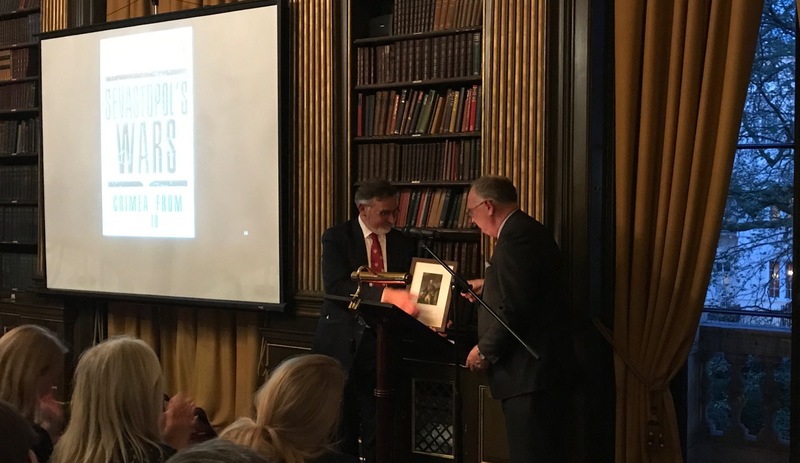 After a short Question and Answer period, Andy Grainger, Secretary General of the British Commission for Military History (BCMH), presented Mungo with a picture of Alexander Suvorov in recognition of Mungo’s service as President of the Commission over the last five years. Over a dozen members of the BCMH, many peer reviewers, were present at the launch; so too was Mrs Barbara Taylor, who produced the series of 16 finely detailed colour maps in Sevastopol’s Wars. The picture of Suvorov was particularly poignant for Mungo as he had written about the great Russian military leader in Sevastopol’s Wars, and visited the site of his famous capture of the fortress of Ochakov on the mouth of the river Dnieper in 1788. On conclusion of the event, Mungo signed a good number of books. The Catering Department of the Reform Club then produced a special surprise for him at a dinner that followed the launch – a birthday cake for the book!